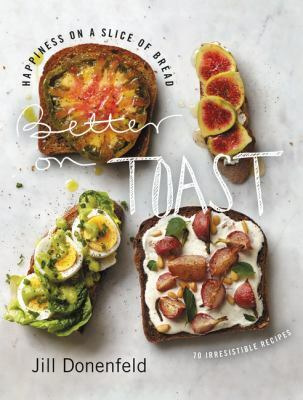 Not that they’ve ever really gone out of style, but pies are enjoying a resurgence of popularity these days with several new books extolling their virtues and delights. And what better time to try some new pie recipes than the holidays? 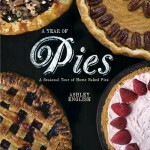 A Year of Pies presents beautifully photographed seasonal recipes that include such delights as a Chocolate & Orange Marmalade Tart in winter, a Strawberry & Rhubarb Ginger Hand Pie in spring, a classic Lattice Top Triple Berry Pie in summer, and Rosemary Bourbon Sweet Potato Pie in autumn. A Basics section offers six piecrust recipes, troubleshooting tips, and advice on selecting seasonal ingredients. An utterly charming collection of regional heirloom American pies, from long-lost recipes to classic favorites, sweetly illustrated and chock-full of time-tested baking tips and secrets for perfect pies Before cooking shows and celebrity chefs there were church dinners, community bake sales, and county fairs-events for which regular women made and served their prized family recipes. 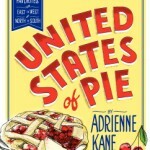 The United States of Pie invites readers on a journey back in time. 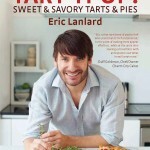 From a ‘proper’ quiche Lorraine to an indulgent raspberry cheesecake pie, Tart it Up shows you the secrets for creating great pies and tarts every time. Pies and tarts are the ultimate comfort food. Whether sweet or savory, elegant or hearty, they are great for relaxed entertaining, family get-togethers and even weekday suppers. A unique combination of old-fashioned chutzpah (becoming your own boss) and cutting edge technology (using twitter to tell your customers where you are), food trucks are all the rage. Significantly cheaper to open than a traditional brick-and-mortar restuarant, food trucks open the door to a better life for newly arrived immigrants (bringing authentic recipes from home) to a creative outlet and financial independence for wannbe-chefs and foodies. Plus, yum! Food Trucks by Heather Shouse tours the country exploring the funky world of street food, from Hawaii to Los Angeles (ground zero for taco trucks) to Miami to New York City. You’d think (at least I did) that food trucks would be most prevelant on the coasts and in the southern, warmer states, but there are plenty of trucks worth seeking out in the Midwest (Madison, WI especially), the North and the Northwest. Interestingly, Chicago is considered a food truck backwater – city regulations prohibiting cooking in the truck means the food has to be prepared offsite, although it looks like that will be changed soon. 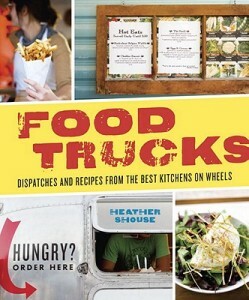 Not quite a cookbook (although there are more than 40 recipes) and not quite a travel guide (although you’re going to want to hunt down some of these gems), Food Trucks is a fun look at a piece of Americana that is alive and kicking. 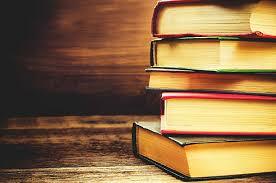 Plus, again, yum!